We’ve recently covered our recommendations on the best dog toys for puppies, we’ve also covered the most indestructible dog beds money can buy so we thought – “why don’t we scour the internet and test out some indestructible dog toys and recommend them to our readers?” so we did and here we are. Dogs can go through hundreds of pounds worth of toys in a short space of time if they’re aggressive heavy chewers and this can lead to a frustrating and expensive experience for both dog and owner. Our Jug Jeff is an aggressive and tenacious chewer believe it or not and we tend to never buy him fluffy teddy like toys or toys that are not made with a solid construction as we’ve learned the hard way that we would be throwing money away if we did. Dogs don’t need to be big in size with powerful jaws packed with big teeth to destroy toys. To save you some time, here is a table with our best choices for each type of toy. What is an indestructible dog toy? Why do dogs want to destroy their toys? At the time of writing, Jeff is is 3 years old and his only toys are durable ones that we’ve curated over the years. When we were looking to upgrade or replace some of his toys we look at specific traits and we’re willing to pay extra for them as we know they will stand a decent length of time and won’t be wrecked in the first hour. Anyway, let’s take a look at what exactly is an indestructible dog toy. So here’s our pick of the bunch for toys for heavy chewers that should last your dog longer than your average toy. These do not appear in any particular order other than the order we were sent them by the manufacturer or added after this page’s original post date. The Kong classic is not just a fine tough toy but we think that the Kong classic could well be the best toy ever. Jeff has had one of these since he was born and at time of writing he is now 3 years old. 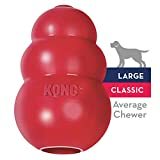 The Kong classic is a ‘puzzle’ toy where you can either put the Kong stuff inside or something other like peanut butter – your dog will lick and lick and be occupied for hours and hours. It’s made of tough rubber that can be very hardy and can easily take a beating over a long period of time. It’s also very cheap to purchase which makes this a very, very good choice. You’d be mad to not get this for your dog in all honesty. Have you got one of these? Please let us know your thoughts int he comment section. oneisall actually put the word indestructible in the name of this fantastic chew toy and judging by how Jeff got on with it and the 250+ reviews on Amazon they’d be right! Made of dense non toxic nylon which has a light bacon flavour which makes the toy irresistible to most dogs. The shape of the bone also makes it joyous to chew and provides good oral hygiene and relief for a teething dog. The blend of tough nylon, bacon flavour and a chew friendly shape makes this an absolute cracker of a chew toy, it’s not the cheapest toy on the list but it’s still relatively cheap and can be picked up for less than £20 in most cases. The Goughnuts toy is one of the more expensive toys in this list and possibly with good reason. The goughnut toy has been designed by mechanical and polymer engineers apparently to create a shape and structure that is virtually indestructible to the point where if your dog has destroyed this toy to reveal the red layer underneath the green then they will replace your toy entirely. However, at a cost of almost £50 you’ve pretty much paid for the replacement anyway. Try this out if you want to take out their promise of a guarantee and if you have money to spare. Have you got one of these? Please let us know your thoughts int he comment section. 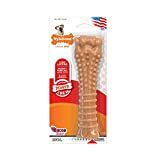 Nylabone are a well known name in the pet world and their ‘tough toy’ entry lives up to their reputation for making great products. Made using reinforced nylon (surprise surprise) and shaped in a way that it cleans and sharpens teeth while massaging the gums. The price is extremely reasonable and is often on offer. This toy will keep your pooch engaged with its tantalising bacon flavour which can even be smelt by humans (it’s actually quite nice if you like bacon!) It will also keep them interested thanks to the ridges and nubs which soothe gums and clean teeth. This is one of the best indestructible toys out there and a worthy entry to our ‘best chew toy’ category thanks to the quality and price point. Don’t believe us? Check out almost a thousand reviews on amazon! The tough ball by Pet Love is a cheap and cheerful ball type toy that’s made of, you guessed it, tough nylon rubber thats ‘virtually indestructible’ and has a 3 year chew proof guarantee which is very brave of any manufacturer. Not only that, the ball has a shaped hollow centre and can be used in a similar way to to the Kong classic. Lovely. To recap, this toy is a cheap (can usually get for under £5) durable dog toy which is somewhat multipurpose as a puzzle toy and a ball toy and has some excellent reviews on Amazon. And for this reason we at JugDog think this is the best indestructible dog ball on the market and is an ideal addition to any dog toy box but it shouldn’t be used alone rather it should be used with other toys for the perfect mix. Have you got one of these? Please let us know your thoughts int he comment section. We were tempted not to list any plush toys on the list as they are at a disadvantage over the other entries but we scoured and scoured and searched for a plush toy that at least stood half a chance and we found one. 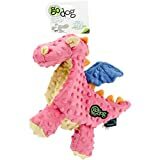 This dragon shaped toy has double stitching and is far more durable than normal plush toys – goDog claim it will last longer than other equivalents because of ‘chew guard technology’ and ‘guarantee’ it but I have a feeling this is just a throwaway statement and not a legally binding contract. Anyway, with a floppy push finish, bright colours and a relatively cheap price there aren’t many plush toys tougher than this one but just be warned this is probably not indestructible due to its nature but as indestructible as you’re ever likely to get a plush toy so it might be a good additional to increase the variety in your dog’s toy box. Features chew guard technology and double stitched seams to be tougher and last longer than standard plush toys...and we guarantee it! Another entry from Nylabone and it’s their Wishbone dog chew product and it’s a corker! Made of (yep, you guessed it) durable nylon, the wishbone chew toy is pretty much 1 and a half of a normal Nylabone in one which gives you more bang for your buck at practically the same cost. The extra ‘leg’ on the toy makes it easier for your dog to hold in their paws giving them an easier time of it. On top of the great design and cheap price the wishbone has also got a light chicken flavour to keep your pooch interested. Perhaps not the best of the indestructible toys as it is rather plain but certainly a good choice for most dog owners. The Kong Tumbler football toy is another entry from Kong and it’s one of the best toys on the list thanks to it’s extremely tough fortified nylon construction and odd shape which makes it difficult to chew to death. The highlight of this toy isn’t the fact that it’s so durable for heavy chewers but that’s it’s got a lot more features than most toys. 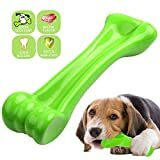 The handles make it easy to play tug of war with the dog while the hollow insides can be used to hide another object like a tennis ball or even foodstuffs like peanut butter or Kong food ‘n’ stuff. This is a superb toy that’s ideal toy for aggressive chewers, it has a fair price point and lots of fun for you and your dog. Have you got one of these? Please let us know your thoughts int he comment section. Does your dog like to chew and swim? If so, this could be the one for you and your furry friend. The West Paw chew is made using “Zogoflex®the pliable, non-toxic material” which we think is science code for durable nylon. The best feature is the fact that it floats on water and the manufacturers offer a one time destruction guarantee. Has your dog destroyed one of these? Claim for another one! As a chew toy it’s not too bad but out of the list this is the best one for outdoor use especially if you have water loving breeds who love a splash. Price point is generous, too. This thing looks like it’s made out of solid steel and perhaps the only toy on the list that would last forever with an aggressive chewer, but it isn’t! It’s actually made of non-toxic nylon would you believe. We’ve seen another ball on the list but we wanted to give another option here for those who may go to beaches with their dogs as this one floats quite well and has excellent reviews for its durability. It’s quite expensive for a ball toy but if the reviews are anything to go by then there’s plenty of return on investment here. We do not state nor do the manufacturers that the toy is truly indestructible only that they are tougher than the average toy. Is your dog chewing and breaking their toys because they simply have nothing else to do? Stop this behaviour by making sure they have plenty of exercise, have plenty of other toys and never left along for more than a few hours. If they have broken one of their toys does it get replaced straight away? Does your dog have too many toys and if one breaks it’s no big deal? A common reason your dog destroys their toys is that they are simply not strong enough to handle their powerful jaws. Powerful chewers should always have durable toys. Is your dog stressed or have they recently experienced some trauma? Toys are a good way to relieve stress but the stress can sometimes spill over resulting in broken toys. Separation anxiety could also cause them to wreck their toys. If you’re concerned, why not place a camera in the house and watch how your dog behaves alone and with their toys. If you have a breed that’s got powerful jaws or a heavy chewer then they may not have the right toys for their needs. This page aims to help you avoid this. Probably the most obvious cause for broken toys is the fact that they just enjoy it and their instincts are driving them to chew to keep their teeth clean and sharp. Squeaky toys also mimic the cries of a dying animal which once again plays into their natural instincts. So here we are looking at some of the most toughest and durable dog toys known to man and man’s best friend. We’re going to go out on a limb here and say that you’re here because your dog’s a powerful chewer and regular toys just aren’t cutting the mustard. Maybe your puppy has now matured enough and has all of their adult teeth which has left their existing toys in a heap. Whatever the reason, we’ve got you covered here. Tough, durable and indestructible dog toys main priority is longevity and to not be destroyed quickly and easily, this can sometimes lead to boring toys that are tough but no dog wants to play with them anyway. This can sometimes force aggressive chewers to take their frustrations out elsewhere which is a disaster for any dog owner. Here at JugDog we make sure to consider two main points – is it tough? And is it fun? Pooch toys come in a wide variety of shapes and sizes, some are simple chew toys, some are shaped like balls, we’ve mentioned plush toys, some have a puzzle element and some are maybe tug toys, each different to suit any sort of dog personality, energy and size. When compiling our recommended list we’ve put a conscious effort to show a wide variety as well as give our recommendation on which is the best overall and best in their category. So, without further ado let’s take a look at Jug Dog’s recommended indestructible toys for heavy chewers! Thanks so much for your time reading this page and our recommendations on the best indestructible dog toys UK. JugDog.co.uk is a community of dog owners and lovers not just of the Jug breed, and as such we value your input. Have you tried one of these toys on offer? Why not let us know your experience in the comments section. Do you have a toy that has been amazing for you and it’s not listed on this page? Then please let us know so we can constantly improve the website. Only toy my border x hasn’t managed to destroy in five years is a ball from Orvis. It was £9 but worth every penny. Had it three months and not a mark on the ball itself. Although she has pulled the logo off but it’s not detrimental. Extreme Kong lasted less than five minutes before chunks came off. Likewise nylon bones don’t last or any other tough toy we have tried. She just loves to chew.